Bioluminescence is the production and emission of light by a living organism as the result of a chemical reaction during which chemical energy is converted to light energy. It is widespread in the marine environment, but rare in terrestrial and especially freshwater environments. Examples include emission of visible light by dinoflagellates, jellyfish, squid, copepods, fireflies, and many other organisms belonging to a wide diversity of taxonomic groups. Bioluminescence aids the survival and reproduction of individual organisms through such means as camouflage and defense, attraction of prey and mates, and communication. At the same time, the phenomena also contributes to human beings' visual experience and enjoyment of nature and its diversity. Furthermore, the creativity with which human beings are endowed has been applied to bioluminescence as well, employing it in biomedical and genetic research, while exploring potential new applications, such as creating plants that luminesce when they need water. Simply defined, bioluminescence is "light produced by a chemical reaction" that "originates in an organism" (Haddock et al. 2006). The term bioluminescence originates from the Greek bios for "living" and the Latin lumen for "light." Bioluminescence is a form of luminescence, or "cold light" emission; less than 20 percent of the light generates thermal radiation. Bioluminescence should not be confused with fluorescence or phosphorescence. In fluorescence, the molecular absorption of a photon triggers the emission of another photon with a longer wavelength. In other words, the energy originates from an external source of light, which is absorbed and almost immediately emitted (Haddock et al. 2006). In phosphorescence, the material absorbs an external source of light as well, but does not immediately re-emit the radiation it absorbs. The absorbed radiation may be re-emitted at a lower intensity for up to several hours. Chimiluminescence (or chemoluminescence) is the general term for production of light via a chemical reaction, and thus bioluminescence is a subset of chemiluminescence, but where the light-producing chemical reaction occurs inside an organism (Haddock et al. 2006). Bioluminescence is generated by an enzyme-catalyzed chemoluminescence reaction, wherein the pigment luciferin is oxidized by the enzyme luciferase. In other words, the chemical luciferin is the one that produces light and the chemical luciferase is the one that drives, or catalyzes, the reaction (Haddock et al. 2006). Adenosine triphosphate (ATP) is involved in most instances. The chemical reaction can occur either within or outside of the cell. In bacteria, the expression of genes related to bioluminescence is controlled by an operon (key nucleotide sequence) called the Lux operon. Image of bioluminescent red tide event of 2005 at a beach in Carlsbad California showing brilliantly glowing crashing waves containing billions of Lingulodinium polyedrum dinoflagellates. The blue light is a result of a luciferase enzyme. Bioluminescence occurs in a great diversity of taxa, including bacteria, fungi, dinoflagellates, annelids, ctenophores (comb jellies), cnidarians (jellyfish), mollusks, crustaceans, echinoderms, and insects, and fish. In comb jellies, jellyfish, and cephalopods, much of the genera have luminous species. However, while nearly all comb-jellies can make light, it should be noted that they also produce brilliant colors via diffraction through their comb plates, rather than bioluminescence, such as seen in the case of the best known comb jelly, Pleurobrachia, which does not luminesce (Haddock 2006). Bioluminescence is primarily a marine phenomena, especially at mid-ocean depths. It is rare in terrestrial environments, and essentially absent in freshwater, with a few exceptions (Haddock et al. 2006). It is not known in plants or tetrapods (amphibians, reptiles, birds, and mammals). Bioluminescence is the predominate source of light in the deep ocean (Haddock et al. 2006). Most marine light-emission belongs in the blue and green light spectrum. For one reason, blue-green light (wavelength around 470 nm) transmits furthest in water, and secondly because most organisms are sensitive only to blue light, lacking visual pigments for longer or shorter wavelengths (Haddock et al. 2006). However, certain loose jawed fish (Malacosteid family) emit red (nearly infrared) light that they can use to see their prey without their prey (or predators) being alerted (Haddock et al. 2006). They also produce blue-green light from a separate organ (Haddock et al. 2006). While terrestrial bioluminescence is less widely distributed, a larger variety in colors are seen. The two best-known forms of land bioluminescence are fireflies and New Zealand glow worms. Other insects, insect larvae, annelids, arachnids, and even species of fungi have been noted to possess bioluminescent abilities. In addition, bioluminescence may be generated by symbiotic organisms carried within a larger organism. There are four main advantages attributed to bioluminescence: Camouflage, attraction, repulsion, and communication. Some squid use bioluminescence to provide counter-illumination, defending against predators by producing light (a soft glow) on their ventral surface to match the light coming from above, making them difficult to detect from below (just as a darker dorsal surface makes aquatic organisms difficult to detect from above) (Haddock et al. 2006). Some can change the color of their luminescence to match moonlight or sunlight (Haddock et al. 2006). Bioluminescence is used as a lure to attract prey by several deep sea fish, such as the anglerfish. A dangling appendage that extends from the head of the fish attracts small animals to within striking distance of the fish. Some fish, however, use a non-bioluminescent lure. A siphonophore uses red light to lure fish to its tentacles. The cookiecutter shark uses bioluminescence for camouflage, but a small patch on its underbelly remains dark and appears as a small fish to large predatory fish like tuna and mackerel. When these fish try to consume the "small fish," they become prey for the the shark. Dinoflagellates have an interesting twist on this mechanism. When a predator of plankton is sensed through motion in the water, the dinoflagellate luminesces. This in turn attracts even larger predators, which then consume the would-be predator of the dinoflagellate. The attraction of mates is another proposed mechanism of bioluminescent action. This is seen actively in fireflies, who use periodic flashing in their abdomens to attract mates in the mating season. In the marine environment this has only been well-documented in certain small crustaceans called ostracods. 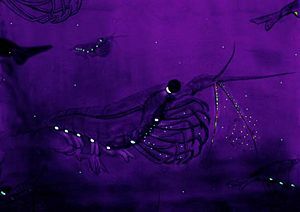 It has been suggested that pheromones may be used for long-distance communication, and bioluminescence used at close range to "home in" on the target. The honey mushroom attracts insects using bioluminescence so that the insects will help disseminate the fungus' spores into the environment. Certain squid and small crustaceans use bioluminescent chemical mixtures, or bioluminescent bacterial slurries in the same way as many squid use ink. A cloud of luminescence is emitted, confusing or repelling a potential predator while the squid or crustacean escapes to safety. Bioluminescence is thought to play a direct role in communication between bacteria. It promotes the symbiotic induction of bacteria into host species, and may play a role in colony aggregation. Some crustaceans send out coded messages by bioluminescence to their own species when it is time to mate (Haddock et al. 2006). Bioluminescent organisms are a target for many areas of research. Luciferase systems are widely used in the field of genetic engineering as reporter genes (genes that researchers attach to another gene of interest in cell culture, animals or plants). Luciferase systems have also been harnessed for biomedical research using bioluminescence imaging. Vibrio symbiosis with numerous marine invertebrates and fish, namely the Hawaiian Bobtail Squid (Euprymna scolopes) is a key model organism for symbiosis, quorum sensing, and bioluminescence. The structure of photophores, the light producing organs in bioluminescent organisms, are being investigated by industrial designers. All cells produce some form of bioluminescence within the electromagnetic spectrum, but most is neither visible nor noticeable to the naked eye. Every organism's bioluminescence is unique in wavelength, duration, timing, and regularity of flashes. Below follows a list of organisms which have been observed to have visible bioluminescence. Haddock, S. H. D., C. M. McDougall, and J. F. Case. 2006 (created 1997). The bioluminescence web page. University of California, Santa Barbara. Retrieved April 6, 2007. Young, R. E., and R. M. Mencher. 1980. Bioluminescence in mesopelagic squid: Diel color change during counterillumination. Science 208: 1286-1288. Young, R. E., and C. F. E. Roper. 1976. Bioluminescent countershading in midwater animals: Evidence from living squid. Science 191: 1046-1048. This page was last modified on 9 June 2016, at 14:34.